What Is the Hierarchy of Clinical Evidence? Any clinical question can be investigated in more than one way. The method by which a hypothesis is tested not only affects the results and format of presentation, but it also serves to provide varying degrees of evidence in support of (or against) the examiner’s question. In addition, based on how they were obtained, study results may be more equipped to imply causation (over simple correlation) and be more (or less) vulnerable to error. In order to clearly stratify results based on the strength of evidence they provide, a hierarchy of clinical evidence has been developed. A robust explanation of this hierarchy is essential to any discussion of evidence-based medicine and clinical research design. 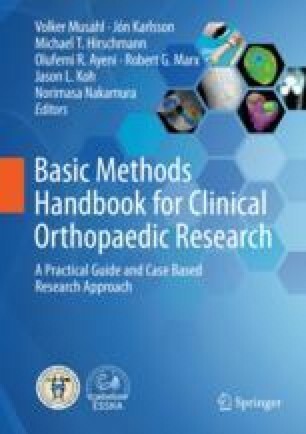 Using an example-based analysis of a clinically relevant orthopedic medicine topic, this chapter will serve to elucidate how the scientific question and goals of the investigator are used to select the appropriate study design. Furthermore, it will highlight the principles, benefits, and limitations of these various study designs. And finally, this chapter will introduce how to hierarchically organize the relative strength of results to ensure that scientific evidence is presented and interpreted in a clinically relevant manner.